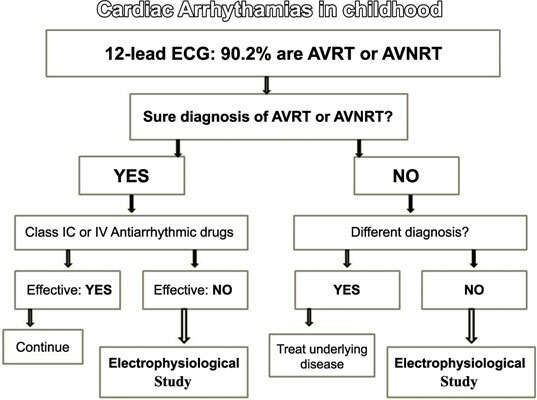 Introduction: Cardiac arrhythmias are challenging diseases in childhood. Most of them in pediatric subjects (90.2%) are atrioventricular reentrant tachycardias and atrioventricular nodal reentrant tachycardias. The standard 12-lead ECG is a highly accurate diagnostic tool but an invasive electrophysiological study is often required. The main concern about this kind of procedures is their invasive nature and the need of radiations, so antiarrhythmic agents are currently the first line therapy. However, they often show side effects and can be insufficient for the rate control. Materials and Methods: We performed a systematic research on Embase and PubMed. We found 563 articles and selected the most representative 50. Discussion: Management of cardiac arrhythmias could be very difficult in several scenarios, especially in children with body weight <15 kg and age <4 years. In general, pediatric subjects show a cumulative risk of malignancy greater than adults, having greater life expectancy. On this basis the guiding principle during radiation delivery in electrophysiological procedures is “as low as reasonably achievable” (acronym: ALARA). The development of 3-dimensional (3D) electroanatomical mapping systems allowed significant reduction of exposure. The most recently reported experiences demonstrate safety and feasibility of fluoroless ablation in the most common arrhythmias in children, even in challenging conditions. Conclusion: The first reasonable approach in cardiac arrhythmias involving younger patients seems to be pharmacological. However antiarrhythmic drugs pose problems both in terms of side effects and often have poor efficacy. Expertise in electrophysiological techniques is constantly increasing and the development of new technologies allow us to encourage the use of electroanatomical mapping systems in order to reduce the radiation exposure in children undergoing to catheter ablation, especially for accessory pathways. Electroanatomical mapping, electrophysiological study, catheter ablation, antiarrhythmic drugs, arrhythmias in children, radiation exposure, non-fluoroscopic cardiac ablation, congenital heart diseases.